PRICE MATCH GUARANTEE ON THIS PRODUCT. Thermostatically controlled 110 volt commercial heater for rooms up to 50 cubic meters has a two year warranty as standard. 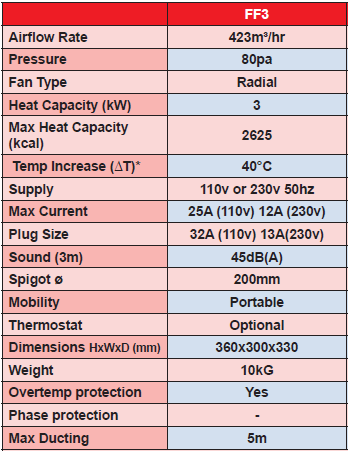 Broughton Blue Giant FF3 110V 3kw portable industrial commercial space fan heater with thermostat and two year warranty. PRICE MATCH GUARANTEE ON THIS PRODUCT! Find the FF3 cheaper anywhere else and we will beat the price by £5. - Is the area I am trying to heat no greater than 60 cubic meters? The Blue Giant series are black element heaters which mean that they increase the temperature of the air gradually. For this to be effective the heater needs to recirculate the heated air. If the area is too large the heater will not be able to cecirculate the air before it has cooled down preventing the heater from having much impact. - Have I got a 110v plug socket or do I need the 230v version for a standard plug socket? Alone in its genre and uniquely able to duct an impressive 5m, the FF3 offers 3KW of clean, dry heat from a tough steel body that is built to keep going and going, long after that cheap import has given up. Available in either 110v or 230v.